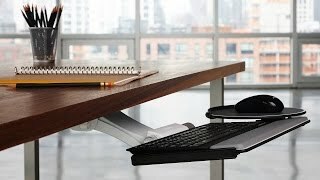 Depending on your unique workstation needs, you need a keyboard tray that fits your individual working style. Humanscale Keyboard Tray Platforms are ideal for users looking to improve ergonomics and productivity in the office. Find the right style for you and feel the difference. Our most popular choice for users with a standard shape keyboard. The 900 platform with rails attached for a clip mouse option. The 950 platform is a compact version of the 900 tray for limited depth spaces. The 500 platform offers ample space to accommodate a keyboard, numeric pad and mouse. The 550 platform is a compact version of the 500 tray. The 100 platform supports natural or wave ergonomic keyboards. A 300 platform features a curved tray design that helps users type and mouse within their neutral reach zone. The 400 platform features a diagonal board design. Choose between black, platinum, and white for your keyboard tray. Please note: Some keyboard trays are only available in black. Humanscale keyboard tray palm rests offer additional support for users while typing and mousing on their keyboard tray. See below for the different models available, including which Humanscale keyboard tray platforms they work with. Humanscale palm supports are available in black only. When designing your Humanscale Keyboard Tray, if you choose to not add a palm support, there will be holes located at the installation points on the tray. $97.00 List Price: $100.00* The list price is the same as the MSRP (Manufacturer's Suggested Retail Price). It may not necessarily be the price at which the product is sold.